So many wonderful new books have found me over the past few weeks, I'm going to have to do this in a few posts. In case you're wondering, I purchased all these books myself (most of them on sale, though, girl loves a bargain!) and am not affiliated with any seller or author. First up, a couple very different books with a theme of celtic/medieval stitching. On the left, Here Be Drolleries: Hundreds More Patterns Graphed from Medieval Sources, by Nancy Spies (Arelate Studio). This is her second book of charts based on medieval illustrations, from illuminated books and other sources. 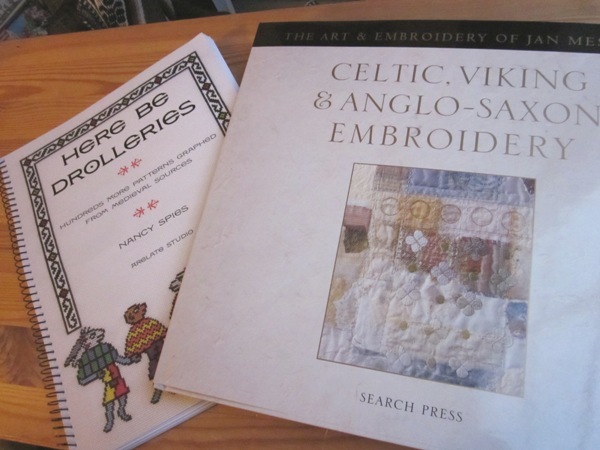 On the right, Celtic, Viking & Anglo-Saxon Embroidery: The Art & Embroidery of Jan Messent. These two books are very, very different. I'd say the only thing they have in common is the author's mutual love of ancient sources. Here be Drolleries is a collection of graphs designed for cross stitch. Like all Arelate Studios patterns, the charts are black and white, well-done and clear, but the book format really makes them shine. Colors may be suggested for each chart, but these really lend themselves well to personalizing with your own ideas for colors. The charts are interspersed with quotes from old manuscripts, and each design's source is given. Most are from medieval Europe and the countries surrounding the Mediterranean. That little needlebook on the right, that wasn't from either of these books, but I threw it in because it was nearby and matched the theme. The labyrinth pattern on the cover is from a Dover book of charts, Celtic Charted Designs. In addition to fantastic animals, the Arelate book also includes charming charts of people, geometric designs, and flowers, like this one. 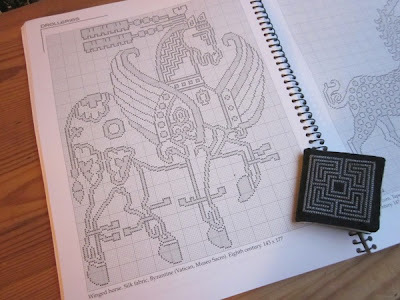 Jan Messent's new book Celtic, Viking & Anglo-Saxon Embroidery: The Art & Embroidery of Jan Messent is completely different, and, to put it mildly, gorgeous. A full-color, glossy-page coffee-table book filled with history and tiny-tiny details. It is oversized and filled with fabulous color pictures of her amazingly detailed embroideries inspired by the Celts and Vikings. In the early pages of the book, Ms. Messent describes how even though textiles do not last when buried for hundreds of years in the ground, the surviving artefacts and fragments "have built up a picture of how those textiles were produced, and from what fibers, how they were dyed, the kind of garments being made and worn and, occaisionally, the embroidery on them....With this knowledge, today's embroiderers can go even further, imagining the decoration that could conceiveably have been used as well as some that might not." This is the point where Ms. Messent jumps off into creating works, that might be somewhat familiar to a woman of Celtic Britain; perhaps, "she might turn the needlecase over and over in her hands and say, 'ah yes, I had one very like this." 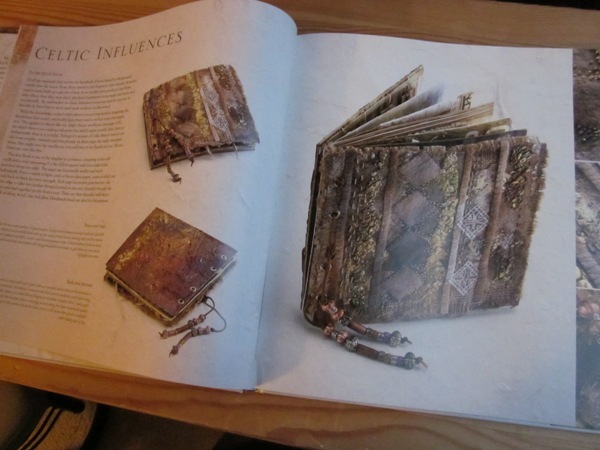 My own pictures of this book's pages can't do them justice (again, it is the awful dim light of the winter in the northwest), so if you want another taste of these pictures, I recommend using Amazon's "look inside this book" feature. 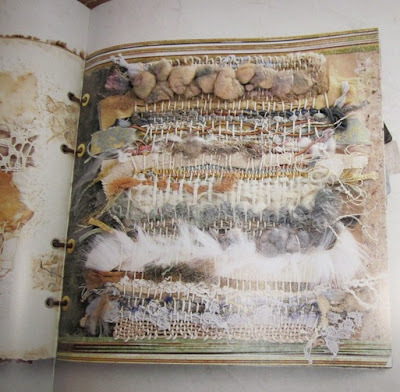 Ms. Messent's explanations of the inspiration and construction of her works are wonderful, and include an idea of the historical context and a general idea of what materials and stitches were used in each piece. Not a "how-to" project book at all, but just the thing to inspire when I get a hankering for another freestyle embroidery experiment. 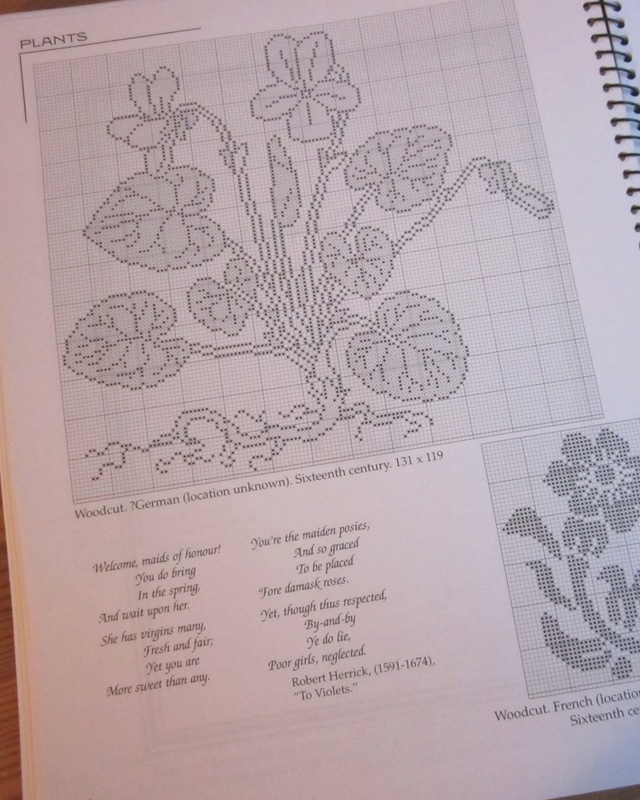 Tomorrow: a couple titles on Scandinavian embroidery!